She said lion's are made for cages, just to look at in delight. You dare not let 'em walk around, 'cause they might just bite. 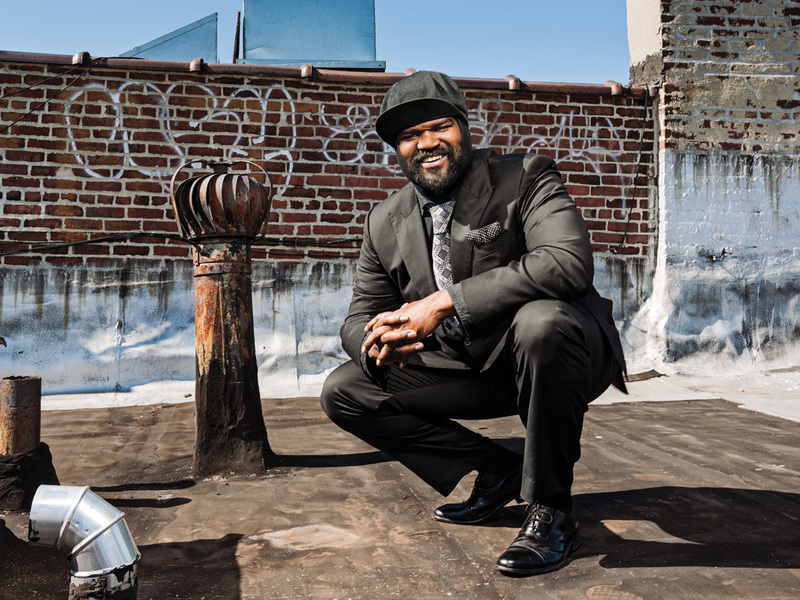 Crowned as "....the next big male vocal jazz star” by Allmusic.com, Gregory Porter was born in Los Angeles, raised in Bakersfield, and now lives in the Bedford-Stuyvesant area of Brooklyn. He got his start singing in small jazz clubs in San Diego, where he lived while at San Diego State University (which he attended on a football scholarship, as an outside linebacker, until a sidelined by a shoulder injury.) His first studio experience resulted in his being featured on Hubert Laws’ Remembers the Unforgettable Nat King Cole (on “Smile”), a particularly apt start for a young man who, as a child, not only used to sing along to the Nat King Cole records his mother would play, but who would go on to impress theater audiences with a deeply personal one man show, Nat King Cole and Me. That show, which ran for two months at the Denver Center for the Performing Arts, was preceded by Porter’s work in It Ain't Nothin' But the Blues. Although he'd only had minimal prior theatrical experience (in the Doo Wop musical "Avenue X"), Porter eventually was cast in one of eight lead roles when the play opened in San Diego, and eventually followed it to Off-Broadway and then Broadway theater, where the New York Times, in its 1999 rave review, mentioned Porter among the show's "powerhouse line up of singers.” It Ain't Nothin' But the Blues went on to earn both Tony and Drama Desk Award nominations that year. According to the New York Times, “Gregory Porter has most of what you want in a male jazz singer, and maybe a thing or two you didn’t know you wanted.” Echoing those sentiments was the BBC's Kevin LeGendre, who said, "Gregory Porter has a voice and musicality to be reckoned with." Two videos off of Water have been released, for the songs “Illusion” and the politically charged “1960 What?” Both have received significant airplay around the country, on such national outlets as VH-1. Did you ever wonder why jazz music seems to be the soundtrack of choice for so many coffee shops? Think about it: when you’re hanging out in a cafe all day long, sipping cup after cup of coffee, or saying yes to just one more shot of espresso, there’s a danger of falling prey to what’s known as the coffee jitters--that moment when your body is so hopped up on caffeine that your limbs start shaking, you get cold sweats, your heart starts racing, and it’s hard to stay focused. With his sumptuously smooth croon, jazz vocalist Gregory Porter is the perfect musical antidote to the jitters, or for anytime you’re in the mood for some high-class contemporary jazz. The Brooklyn-based artist, originally from Southern California, recently released his sophomore album, Be Good. It’s a follow-up to his 2010 debut, Water, which earned him a Grammy nomination for Best Jazz Vocal, and an international reputation by topping charts across Europe. On Be Good, Porter has put together a 12-song collection of everything from soulful ballads, to upbeat charmers. Alongside Porter are band members Chip Crawford (piano), Aaron James (bass), Emanuel Harrold (drums), and Yosuke Sato (alto sax), as well as guest instrumentalists Keyon Harrold (trumpet), Tivon Pennicott (tenor sax), and horn arrangements by Kamau Kenyatta. Opening track “Painted On Canvas” gently eases into the album, with the lightest brush of cymbals, a tickle of ivory, and fluttering sax lines. Starting with instrumentation and a spoken word introduction, reminiscent of ‘70s greats like Lou Rawls and the Chi Lights, “Real Good Hands” is Porter’s musical version of seeking his girlfriend’s parent’s permission for her hand in marriage (“you’re leaving her in real good hands/I’m a real good man,” Porter promises). He goes on to try his hand at flattery (“you’re the picture of the man/that I someday want to be” he directs towards the father), sounding so sincerely romantic that you can’t imagine anyone turning down his request. But, arguably, the real album stand-out is “On My Way To Harlem,” an upbeat tribute to the vibrant New York neighborhood that encompasses the spirit of artists like Marvin Gaye (“Marvin Gaye used to play ‘What’s Going On?’ right over there,” sings Porter) and Duke Ellington (“there goes that A train through Harlem,” which plays off of Ellington’s classic song, “Take The A Train”). It’s also the album’s longest track, just shy of eight minutes. It might seem like a long song for a generation who’s used to listening to music in 30 second samples, but there’s such a sense of true musicality that every sound stays fresh.